What's better than going to your favorite camping? 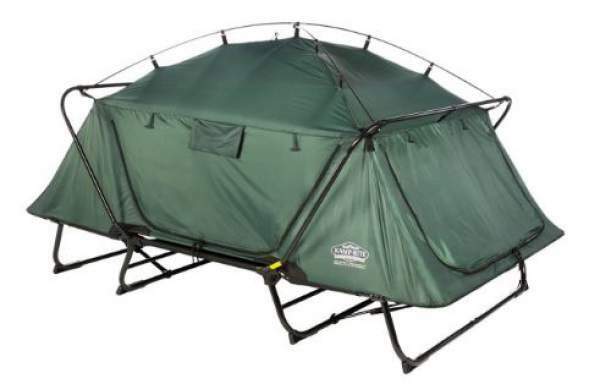 Going there with someone you love in the best 2 person tent cot! Unless you like getting rained on when you go by yourself, then just keep doing what you're doing. There are plenty of options out there, but with the explosion of private manufactures making off brands, it's hard to know which ones to trust besides the tried and true. So we took the time to do the research and test the cots to see which ones make the most sense for you. 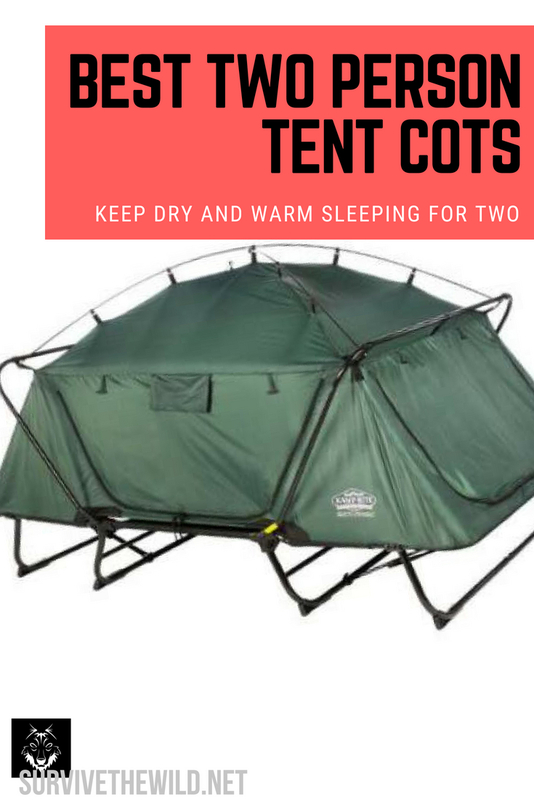 Let's not kid ourselves folks, a two person outdoor bed is not going to fold down into something as easy to carry as an ultralight option. So from the beginning let's establish that your options are either a basic bi-fold option (will fold down to look like a skinny square) or a collapsable pole option (will fold down to fit in a long kind of skinny side-carry case). If you're camping as a couple, it's going to be important to remember that one person will have their hands full with just the outdoor bed, so it would be smart to only bring one backpack. That way the load is distributed evenly, and you don't have a partner that gets more frustrated with every step they take. Unless you're truck camping, then you can come and go as you please! Most of these options are going to weigh more than 45 lbs. So that's good to keep in mind for the lucky soul that gets to carry the bed. Padding is an option that's going to be a BYOM situation (Bring Your Own Mattress). The good news is that inflatable camping cot mattresses are very compact and light, so they won't make this trip much harder than it already is. There are also self inflating options, but these use multi-cell foam which can take up a lot of space even when collapsed. They are also a good bit heavier than an inflatable option. 3 pounds compared to 1 pound. Just sayin'. Most of these cots don't come with a weather proofing option, like a rain sleeve, or a mosquito net. You'll have to make sure you get the correct weather proofing add ons yourselves when you're shopping. They are a very necessary thing to have though. Mother nature doesn't follow the weather channel's guidance when she decides to let loose. So spending an extra $20 for a rain sleeve is a lot better than waking up from sleeping on your side to a surprise rain storm in the middle of the night for the sake of saving money. Also mosquitos can ruin a trip in a matter of hours, because no one wants to get eaten alive by those things and spend the next few days itching. Make the investment, please! Winterial is a new brand that's come up pretty fast in the camping space, and they've done a lot to capitalize on the mistakes of their competitors. They've gotten rid of the cross bar that runs horizontally through other cots, which makes a HUGE difference in sleeping comfort. It does come with a thin pad, but it's still recommended to bring your own if you truly want to be comfortable. In our opinion, the set up is a bit cumbersome. Most cots have a lock-in-place method to smooth out the process, but the push pins on this product make it a bit more difficult. Also it would be convenient if the zippers could be made to open from both sides. If you're shopping based on a name that you recognize/trust, then the most reliable is the Kamp Rite Double Tent Cot. The weight of this bed is more than the Winterial option, at 51lbs it's a good bit heavier. However it folds down the same as the competitor, into a big square. There are quite a few steps to master when setting this one up. You'll notice the straps that connect the legs underneath the mattress, and the cover that has to go on top. The cover has to be put on after the bed has been set up, and the rain cover is sold separately.